Let’s start with a very scientific-looking chart that explains the difference between writing about contemporary games and retrogaming journalism. 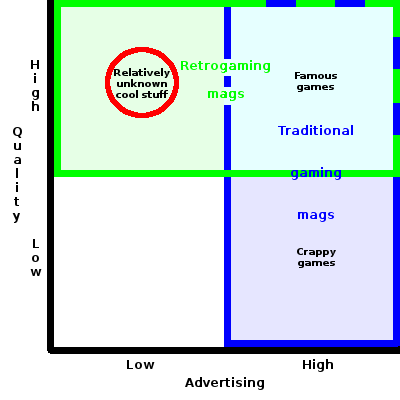 On the vertical axis, we’ll have game quality. On the horizontal axis, we’ll have advertising. At any given time, there’s more games than any paper magazine in the past or online magazine today could review. So the role of contemporary mags usually is to give the players guidance whether to buy big titles or not. They work as guardians of gamers’ wallets. With retrogaming it’s different. The wheat was separated from the chaff long ago. We already know how much the licensed Superman and Knight Rider games sucked. But there are still thousands of games that have never made it into the limelight – sometimes because of a bad marketing strategy, sometimes because they were made by great creators who, unfortunately, had no idea about that a good game won’t sell by itself, and sometimes just because of a chain of unfortunate events. Finding such games and giving them some belated justice is one of the major tasks of retrogaming mags. Or of ours at least. Discovering cool games that never got famous is one of our goals. So this article introduces Cool Stuff—our tips for games that you might have never heard of because they never got the recognition they deserved. … there was an Italian company called Simulmondo. They made games for the Commodore 64, Amiga, and DOS. The games had two good things in common: they always looked good, and they were always at least solid. I don’t remember playing a single one bad Simulmondo game. I liked some of them more, some of them less, but I always liked them. 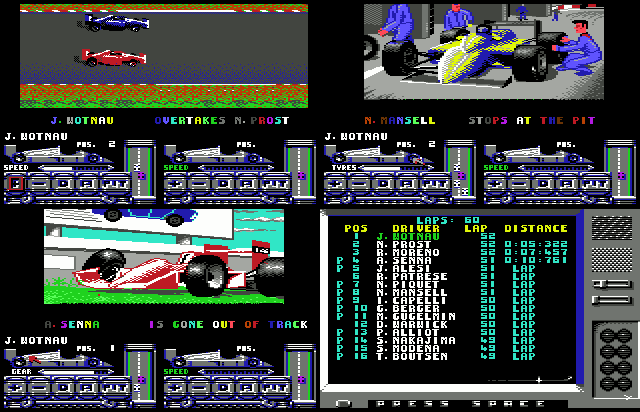 And one of them I simply loved: Formula 1 3D: F.1 Manager II. It’s a pity that Simulmondo did games only for the C=64 on the 8-bitters, because the game would have definitely been doable on the other platforms. The graphics look pretty, but the game’s not really color-demanding, so the usual color downgrade for the Spectrum and Atari 8-bit wouldn’t have mattered. I guess a hires Spectrum version would have had a certain charm. Sounds are limited to the engine noises, which all of the 8-bitters are capable of, and just one, very special, tune. Its specialty consists in that even though I normally hate short repetitive tunes with bad instruments, there’s some strange magic to this one: even though it’s horrible, I’m very fond of it and sometimes just can’t help myself humming it even when I do something totally computer-unrelated. As the company’s name suggests, they did a lot of (although by far not exclusively) sims. 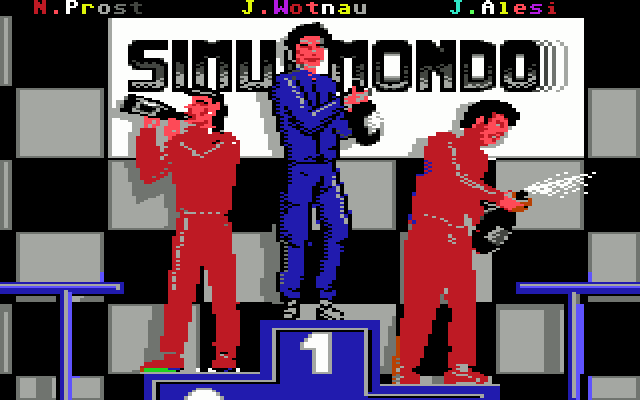 As the game’s name suggests, it’s a Formula 1 simulator/manager game. And it’s symbolic that such a good game of this kind comes from Italy, the home of the company that’s almost synonymous with F1: Ferrari. 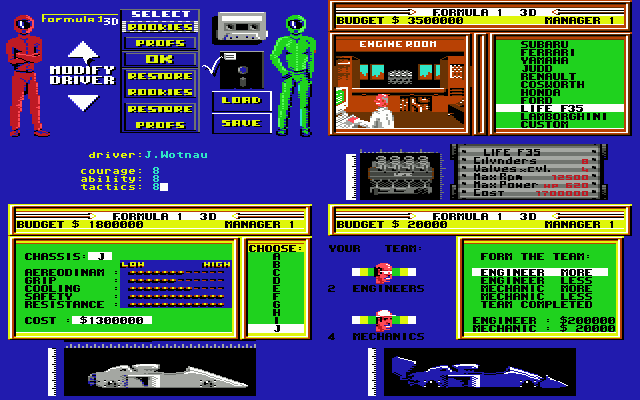 Formula 1 3D: F.1 Manager II (I’ll call it just F1 3D from here on), published in 1991, is not really a sequel to the original F.1 Manager from 1989. It’s a crossbred between a translation and a remake. The original was in Italian only, while in F1 3D, you can choose between Italian and English. Other than that, just a few pictures got changed, a few details were added on the managerial side, and the difficulty got tweaked a bit. Nothing 3D was actually added: the first game had been in 3D already, but in the early 90s, the 3D madness took over, plus Simulmondo published I Play – 3D Soccer, I Play – 3D Tennis, and even 3D Scacchi Simulator (3D chess, even though 3D views had been common in chess games since the early 80s, therefore there was no rational reason to point that out) around that time as well, so it might have been their naming strategy for sports games. That’s what I’d call a pressFkeybait. The game is a typical manager in that you have to work with limited resources. You can play alone or with a friend. You start with a budget of $6 million, and you have to divide it between your pilot, engine, chassis, and staff. Are you going to put a lousy driver into the seat of a great car, or will you make compromises on the car design side, hoping that a good driver will still be able to overtake with it? And where exactly are you going to save? Pilots have three stats: courage, ability, and tactics. Gonna go for an incapable kamikaze or a boring tactician? The engine parameters are cylinders, valves x cyl., max. RPM, HP. The chassis are characterized by aerodynamics, grip, cooling, safety, and resistance. If you neglect the aero, your car will be slow, with low cooling you’ll risk that your car will overheat, and so on. And if you don’t have enough engineers and mechanics, will you be able to extract the maximum from the car? Create your driver, pick your engine and chassis, get some staff, and you’re good to go! It will take you a while to find a combination that works best for your managerial and driving style. And that’s what’s so great about the game! On the 8-bitters, most sports simulations are heavily imbalanced. Either they are a tiring, endless series of menus that will put you to sleep after a while, or they are badly covered action games where most of your choices won’t really matter. F1 3D serves a yummy blend for both your brains and hands. Set up your car and go for it. Hitting those apexes really matters! After the qualifying, you move into the role of the team boss, sitting on the pit wall, watching the race on TV, following the car data via telemetry, and instructing your pilot how to drive according to all of that. You control the speed of the pilot and the driving style (defensive or aggressive), and you also decide when to make pit stops. You make these decisions based on your position, the state of the car’s front and rear tires and the gearbox, the temperature of the engine, and the remaining fuel. In the meantime, the TV feed serves you the overtaking maneuvers and other highlights, like pilots’ excursions off the track or their technical problems. A lot can happen during the race. And your decisions matter! If your tires are in a bad shape and you want your driver to drive too fast and too aggressively, you usually end up in a wall. You’ll be as nervous and foot-tapping as any real team boss, watching the feed and waiting what’s going to happen next. Will the increased aggression get your pilot ahead, or will he overdo it? Will the tires last till the end, because you want to avoid another pit stop? Is the driver behind, who has been getting closer lap by lap, able to overtake your driver? Should you turn the engine down because it’s getting very hot? These questions will nag at you and your heart will skip a beat anytime you’ll see the name of your driver on the screen. If you pick your strategy well (and your driver isn’t too shabby), you can make progress through the field. Yet the game is so well balanced that if you qualify plumb last, usually you can’t make it to the points, let alone victory. So you can gain and lose in both the action and the managerial part of the game. As a pilot you want to win, but as a team boss you have to secure your team’s future in the first place, so in the end everything translates to money. You get prize money for qualifying and your end result in the race, you lose money if you wreck your car and have to fix it, and before every race you can select a sponsor, who will reward your end result. Each sponsor has a different financial strength, so it pays off to select the best ones for the races where you know you usually perform well. Therefore you have two goals every season: become the world champion and have enough money to run the team for one more year, possibly with a better car and/or pilot. Time to celebrate! A race victory in-game and a great game on our side of the monitor. But, actually, there’s a third goal with which I always start this game: just play it. Because it’s nice, because it’s very playable and addictive (just one more race! ), and because it’s fun. It’s Cool Stuff!